Travel Notes: Is Thailand still safe for tourists? Is Thailand still safe for tourists? As the anti-government protests continue in Bangkok now with two violent incidents days apart, I field many questions from increasingly worried Europeans about to go to Thailand or thinking thinking about it. Most everyone understands that the events unfolding in Thailand have no parallel whatsoever with the violent events of the Arab Spring. This is not about religious extremism or nationalism, the two opposing factions are actually relatively moderate ideologically. 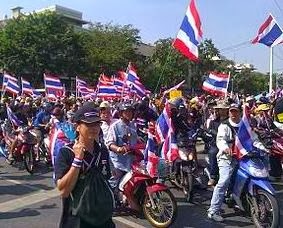 At the root of the current crisis is the enduring social and economic divide that far too frequently has caused chronic political crises and recurring military coups for the last forty years of modern Thailand. The above preamble should help understand why tourists, and foreigners in general, are not targeted, they are not even a part in the equation. In fact, both factions are quite worried about upsetting tourists, even as they are damaging the image of the Thai tourism industry a little more every week. Casual reports from tourists in Bangkok finding themselves in or near demonstrations point out that anti-government protesters are eager to explain their plight and they are even offered bottles of water or food to keep them in the conversation. And at least one of these tourists reported encountering the very same attitude in Chiang Mai when they found themselves in the middle of a pro-government demonstration. But lest not fool ourselves into believing that all is well and that no one is at risk. Tourists are not a target, but they could well become collateral victims if they are at the wrong place at the wrong time. Being in or near a mass demonstration, anywhere in the world, is a casualty risk. The grenades that exploded into the crowd were thrown indiscriminately. The odds that foreigners or tourists would be at that very spot then are very low, but they remain very real. So, it is common sense to stay away from the hot spots so that if something goes wrong you don’t become a collateral casualty. Should you avoid Bangkok and go elsewhere in Thailand? While the demonstrations can make it a bit of a hassle to get around, most tourist sites are unaffected and the shopping malls are eager to get your business. Hotels are hurt by cancellations, no question about that, with many of them trying very hard to salvage their peak season with discounts, special offers and extra facilities to keep you happy and staying! Airports are not affected this time around, common sense still prevails! If you are connecting between the main airport, Suvarnabhumi, and Don Mueang airport (Air Asia, Nok Air, etc.) the shuttle or the taxi do not go into Bangkok, but use the expressway between the two airports instead. So, don’t cancel your vacations plans. But be flexible with hotel and domestic flights, avoid non-refundable bookings so that you can adapt your itinerary on the go. While it is peak season in Thailand, you can easily find rooms and domestic flights on short notice with little or no premium price. In Bangkok right now, you could even come across some unusually low hotel walk-in rates. If you are a tourism professional, you may want to read "Now is a great time to sell Thailand!" on my Tourism Industry Trends blog. How to avoid tourist restaurants! Airline food is looking better! Is your holiday destination safe enough? So, you lost my recipes, again! Copyright 2014 Patrice Veuthey. Travel theme. Powered by Blogger.